Johannesburg, South Africa: Four continental derbies took centre stage on on a sold-out Day 8 of the Hockey World League Semi-Finals at Johannesburg’s University of the Witwatersrand, with Spain, Australia, Egypt and Germany all claiming crucial wins in the men’s competition. 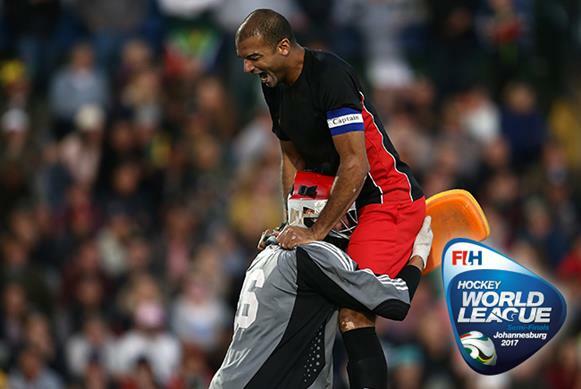 In the first of the regional head-to-heads, Spain (FIH Hero World Ranking: 10) were given a stern test by France (WR: 17) before emerging 2-0 winners in Pool A to move onto six points and remain in the hunt for a top of the table finish. The Red Sticks – coached by former France international Frederic Soyez – had to wait until the end of the third quarter before Pau Quemada scored from the penalty spot, with Enrique Gonzalez adding a second after France had replaced their goalkeeper with an outfield player in search of an equaliser. While Spain were worthy winners, France showed yet again that they are capable of competing with the best, having gone through a tough pool phase without being outclassed by any of their opponents. That said, France now have to wait until the completion of the pool phase on Monday (17 July) before knowing their final placement and who they will face in the cross-over quarter-finals. The second match of the day was also in Pool A, with reigning world champions Australia (WR: 2) battling back from a goal down to beat New Zealand (WR: 8) in the Oceania derby. It was a third win in succession for the Kookaburras, who now need just one point in their final pool match against Japan to confirm their place at the top of the standings and set up a quarter-final contest with the team that finishes fourth in Pool B. The Black Sticks held their own against the higher-ranked Australians throughout the match, taking the lead when Jared Panchia bundled home from close range after the Kookaburras defence failed to deal with a searching Hayden Phillips’ cross from the right. However, for the second time in the competition, Australia scored twice in the final quarter to claim all three points with a ferocious Jeremy Edwards’ backhand finding the roof of the net before an outstanding final minute penalty corner drag-flick from Jeremy Hayward gave Australia all three points. In Pool B, the home fans turned up in their thousands to watch South Africa (WR: 15) in action against Egypt (WR: 19), but the team from north Africa spoiled the party by taking a 2-1 victory. Egypt went into the contest knowing that only a win would be enough for them to have any chance of reaching the competition quarter-finals, which in turn would keep the World Cup and World League Final qualification dream alive. After 29 minutes without a goal, two came along in quick succession with Houssam Ghobran’s clever reverse flick putting Egypt ahead before Daniel Sibbald levelled for the home side just before half time. Ghobran netted a second before the end of the third quarter, which proved to be the winner despite Egypt playing most of the fourth quarter with nine players due to yellow card suspensions. South Africa threw everything they had at their opponents, but found goalkeeper Wael Noureldin in inspired form to give his side a vital win. The day’s final match was arguably the best of the four, with Belgium and Germany showing exactly why they are two of the world’s best teams in a contest of great skill, intensity and high energy. Die Honamas ended up taking a 3-2 win over the Red Lions, putting themselves three points clear at the top of Pool B ahead of the final round of pool matches on Monday. Marco Miltkau gave Germany the lead on the stroke of half time before a brilliant solo effort from Arthur van Doren tied the scores early in the third period. Simon Gougnard scored one of the best goals of the day, receiving an overhead pass before volleying past Germany goalkeeper Tobias Walter to give Belgium a lead that would last just three minutes, with Lukas Windfeder’s penalty corner making the score 2-2 going into the final quarter. Germany’s winner arrived six minutes from full time, with Dieter Linnekogel getting a crucial touch on a speculative pass into the Belgian circle, while shot-stopper Walter produced a stunning acrobatic save in the dying seconds to guarantee victory for Die Honamas. On Sunday 16th July, the final four matches of the women’s pools will take place to decide the line up for the quarter-finals. Japan and Germany take to the field for their Pool A contest at 1200 South African Standard Time (UTC +2) before England and Ireland, who also compete in Pool A, face-off at 1400. Pool B draws to a close with the day’s two final matches, with hosts South Africa needing a win against USA at 1600 ahead of the Argentina versus India clash at 1800.